DETROIT, Mich. — Coach LaCema Womack added a second women’s track member on Tuesday (07/10) with the signing of A’Shantae Barker. The signing was the second of the day for Allen Academy as Barker joins former high school teammate Diamond Easton at Marygrove. Barker, a 5’6″ sprinter/mid-distance runner, is headed to Marygrove with three years of varsity experience at Allen Academy. While running at Allen Academy, Barker starred in the 100m, 200m, 400m, and 4x100m â the same events in which the newly-signing Diamond Easton excelled in. Barker, like Easton, would help Allen Academy win a 2010 Conference Championship to cap off a successful season. Barker was also named a Scholar Runner due to a great focus in the classroom while excelling in her sport. 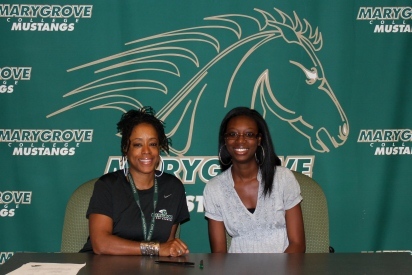 Coach Womack on Barker: A’Shantae is another great addition to our programs at Marygrove College. A’Shantae hails from a solid high school program that will help her as she transitions to the collegiate level. I look forwad to coaching A’Shantae and the rest of the 2012 recruits next season.